To be totally honest, the 56th Annual Escapade held in Essex Junction, Vermont, was intended to be a fun way to knock out one of the five remaining states yet unvisited by me (Rule to count: must spend the night and do something other than eat) With the main goal of a trip to Vermont, I thought Jim and I might learn some things that would be helpful to us in our RV lifestyle. The chance that we might meet some folks with whom we might have fun and possibly become friends would be a bonus to the other two goals. The fact that Jim and I were able to enjoy the entire month of July traveling over the eastern portion of our beautiful country was the ultimate; it is one of the best trips I’ve ever had. Truly, it was the journey, not the destination, that made this experience special. We were blessed to learn about a week into our trip that Jim would definitely be working a 1 to 3-month project beginning August 1st. As we began figuring out logistics, it was quickly apparent that the only way to make things work would be to leave the Escapade on Thursday morning rather than when it actually wrapped up on Friday morning. I wonder if one of our names was drawn for the grand prize, but we’ll probably never know, and that is best. This gave us three days to get us back to the Cleveland, Ohio, area where the camper, the dog, and I could stay while he goes to work in Alaska for two weeks. When he returns, we’ll have two days to get back to Middle Tennessee where I’ll stay until his project in Alaska finishes. Now, what about the Escapade? 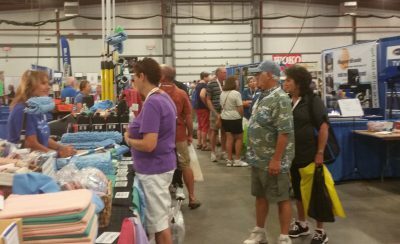 It is an annual event sponsored by the Escapees RV Club, and this year’s event was fun and informative. I really enjoyed the opening ceremonies, so I am slightly sad that we missed the closing ceremonies on Thursday afternoon and the “Hitch Up” breakfast on Friday morning. 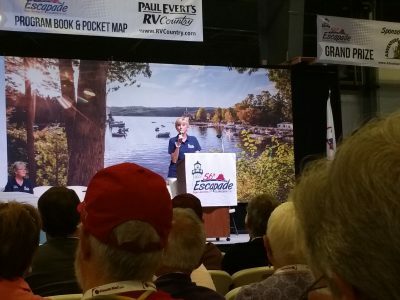 I did learn a great deal in the seminars, but I was a bit disappointed to see that the focus in a few was totally geared toward motor homes despite the fact that many of us drove travel trailers, 5th Wheels, and other forms of campers. 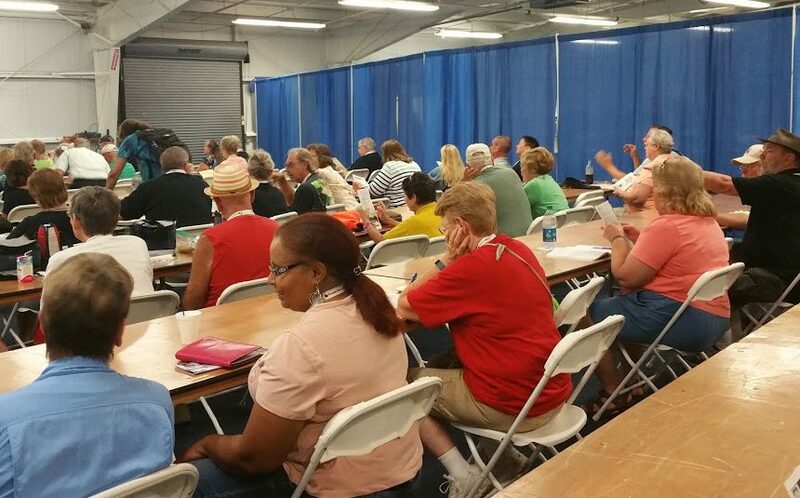 The older Escapees who have frequently attended such events were very friendly and welcoming, but because it is rare to have this event in the eastern portion of the country, a huge number of attendees were first timers like us. It was announced that there were about 2,400 people there, and the majority were first timers. I believe this made folks a little more uncertain and less engaged with each other; all of us first-time attendees were treading water, you might say. This does not put me off going again, but who knows when it will work into our schedule. By far the positives of the educational seminars out-weighed any issues I might have had with them. I imagine much thought and research will go into some of the things we learned or learned about, and Jim and I have already implemented a few things gleaned from the educational portion of the event. He and I joined the local Escapee Chapter for Tennessee and Kentucky, and I joined the “Birds of a Feather” group for geocaching. Many social activities were had, but unfortunately some overlapped, and even worse, some were at times that we needed to be prepping to leave a day early. Of those we attended, my absolute favorite was the First Timers social; there was a big group, and we enjoyed talking with people we met at the table at which we sat. The scheduled entertainment was diverse, and I enjoyed the ones we attended. Jimmy Travis, musical comedian from Nashville, Tennessee, made me laugh until my jaws hurt; he was great! All and all, I would do it again. Knowing what I know now, I may have made some different choices about seminars attended or taking part in various social activities, but I do not regret going. While we did not (at least, it is not apparent at this point) make any friends that I feel will be life-long buds, we did meet some new people and hope to see them down the road later on. Hopefully, Jim will have time to add his thoughts later on.